No, I haven’t just got back from a holiday in New York. We’re not going on holiday this year and I’ve been remembering past holidays, one in particular. This post is about a holiday of a few years ago but it’s still so vivid in my mind. Picture this. 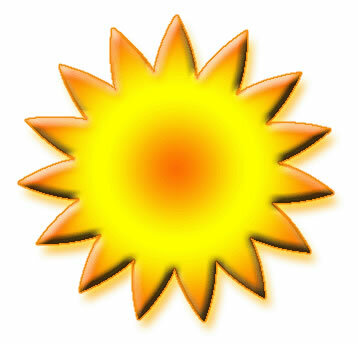 A day when the sun warms the top of your head and the air smells of sunshine and the world is all lit up. Come with me now. I’m going to take you through the first glorious day of a holiday in New York. We leave our hotel in mid-town Manhattan at about 9 o’clock in the morning (‘we’ being my husband Ian and me). As we stroll to the subway entrance at the end of the street a warm breeze caresses my hair with feathery fingertips. The sky is a brilliant shade of blue. It’s easy now to forget yesterday’s dull, damp evening when we’d arrived at JFK airport to be greeted by an official with a frown from a freezer and a voice to wear ear plugs for. She strode up and down bellowing at anyone who inadvertently stepped out of line during the long, long wait in a long, long queue. After being questioned, frisked over and finger-printed, we spent more than an hour, with nowhere to sit, as we waited for the shuttle bus. Yes, we should have got a taxi but we’d naively bought the bus ticket in advance. At the hotel we dropped off our cases and then went outside to roam streets of dark drizzle. Now there are plenty of places in New York where you can get a delicious vegan meal, but on that evening we kept passing restaurants that smelled of grilled, fried or roasted dead animals. Eventually, tired, wet and hungry, we stumbled upon a place where we could eat, but the meal consisted mainly of a pile of green beans. We then trudged back to the hotel, getting lost on the way in dismal, rain-drenched streets. But how different these same streets look now on this shiny new morning. We go down into the bustling subway. After a short train journey, we get off at the southernmost tip of Manhattan, the Battery, so named because there were once cannons here to protect the harbour. There’s a carnival atmosphere in the Battery today. 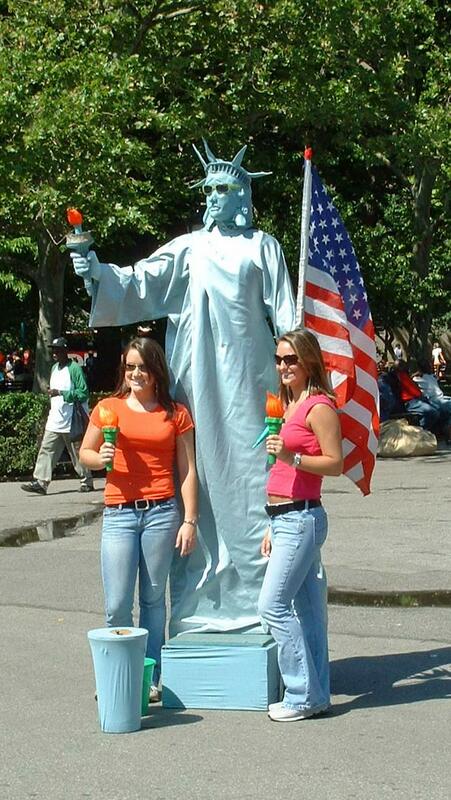 Someone is dressed up to look like the Statue of Liberty and two young women pose to have their photograph taken with this friendly statue. We stand and watch for a while and then weave our way to the terminal for the Staten Island ferry. Glancing back at the Battery crowd, The Statue of Liberty waves to us. Amazingly, the half-hour crossing of the five-mile expanse of the harbour between Manhattan and Staten Island is free. No orderly queuing here. Even the surly airport official would have been subdued into silence by this unstoppable crowd who make an undignified rush to board the big orange ferry. We’ve made it. We’re on. 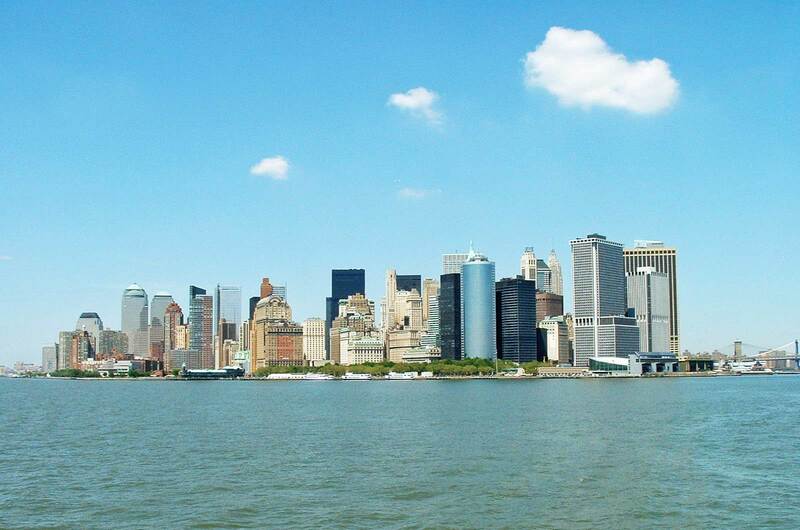 The sights from the boat include stunning views of Lower Manhattan with its exciting skyscrapers, the real Statue of Liberty (which doesn’t wave to us), Ellis Island, Brooklyn and the Verrazano Narrows Bridge. Seeing them from the sparkling water, and at changing distances and angles, brings a whole new perspective on New York’s profile. The trailing white wake from our Ferry froths up the deep-blue ripples. Despite the occasional squawking of seagulls, the constant low droning of the engine and the excited chatter of the boat crowd, the overall scene breathes tranquillity. We get off at St George on Staten Island. 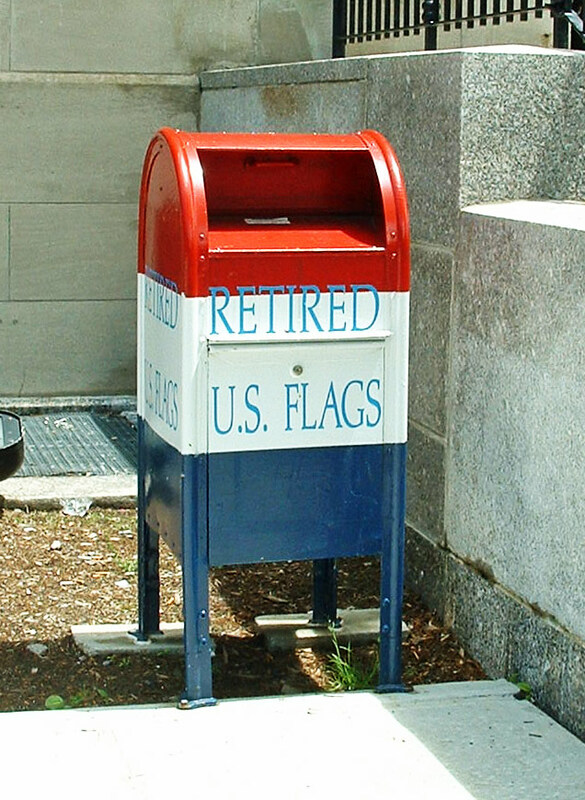 A bin stands on the pavement by a wall, with a notice which reads: ‘Retired US Flags’. In a café where we eat falafels, the Russian proprietor can’t seem to understand our Yorkshire accent. That doesn’t stop Ian chattering away to him, resulting in us spending much longer than intended in the café. When I gently point this out to Ian he warns me that if I don’t stop nagging I’ll be joining the retired flags in the bin. The return journey on the Ferry is every inch as magical as the outward journey. Approaching the Manhattan skyline gives me a clear sense of Manhattan as an Island, something I’d known but not felt before. I can imagine this scene at sunset, the sky streaked with crimson and orange. We disembark and make our way north into the financial district at the side of the Hudson River, past the marina where yachts and big boats rest peacefully in the glittering water before their next trip. On we go past Ground Zero, the eerie space where the Twin Towers used to be. This is a few years ago before the new building work on this site started. Reminded of those innocent victims of terrorism who died there, and their grieving families and friends, I feel the tug between the sadness of this in strong contrast with the bright day we’re enjoying. But that’s life, isn’t it? Sadness and joy, light and darkness, and the myriad shifting shades in-between. We pause for a while. And then move on. We stroll into Chinatown on the lower East side of Manhattan. The majority of Chinese New Yorkers live here in this crowded and expanding neighbourhood. The busy, winding streets are full of cafes, restaurants, Chinese bakery shops, and fruit and fish markets, bringing a variety of smells which mingle in the warm air. Passing the Eastern States Buddhist Temple with its wooden pagoda roof, you get a whiff of incense but this is mixed with the aroma of duck fat and noodles from a nearby restaurant. Many of the cramped shops spread out into the streets with goods displayed on stalls or in open cardboard boxes on the pavement. Boxes outside food stores contain dried noodles, pickled green vegetables, jars of pickled ginger, shortbread biscuits in fancy baskets and various sweets. I love the tangy fruity flavour of the Guava candies. Non-food items sold in shops and by the many street vendors include just about everything: knickknacks, jewellery, clothing, handbags, perfume and craft ware. But don’t buy what you don’t want and don’t pay what they ask first. Have fun bargaining. How about a pair of durable rubber clogs for only five dollars? Or a hand-painted dragon scroll? Perhaps you’ll be tempted to go through one of the basement entrances advertising a Back Rub. I wonder why heavily made up women lurk outside these places. It’s early evening, still pleasantly warm, when we enter the House of Vegetarian, a restaurant on the famous Mott Street in the heart of Chinatown. A mixture of smells thrill our senses: subtle spices and seasonings, the aroma of bean curd sheets soaked in garlic and mushroom broth. The menu boasts every kind of vegetable imaginable, and spring rolls, seaweed sushi, spinach dumplings, fried turnip cakes. A range of fake meats made from Soya includes mock chicken and mango, and vegetarian duck. Eagerly we order our food. When it comes, each part of the meal that we thought would be small individual portions arrives in bowls big enough to serve at least two people. The waitresses keep bringing more and more food to our table. We sheepishly check the menu and only then do we notice that each of the portions we’d ordered cost more dollars than other items on the menu. (erm, that should have told us something). Despite this, it’s not overly expensive, but it is embarrassing. When we see a waitress carrying a huge bowl of rice, we say, ‘God, I hope that isn’t ours as well.’ This is supposed to be a joke; we’ve already got a big bowl of rice on our table. But… oh dear, she brings it to us. We try to explain to the waitress but her attitude is we’ve ordered it, it’s ours. I hate wasting food; people are starving. I’d gladly round up some vagrants to join us but I’ve seen none in Chinatown and, anyway, I don’t think the restaurant owner would approve. After disgracing ourselves here, we make a quick getaway through Chinatown into Little Italy. 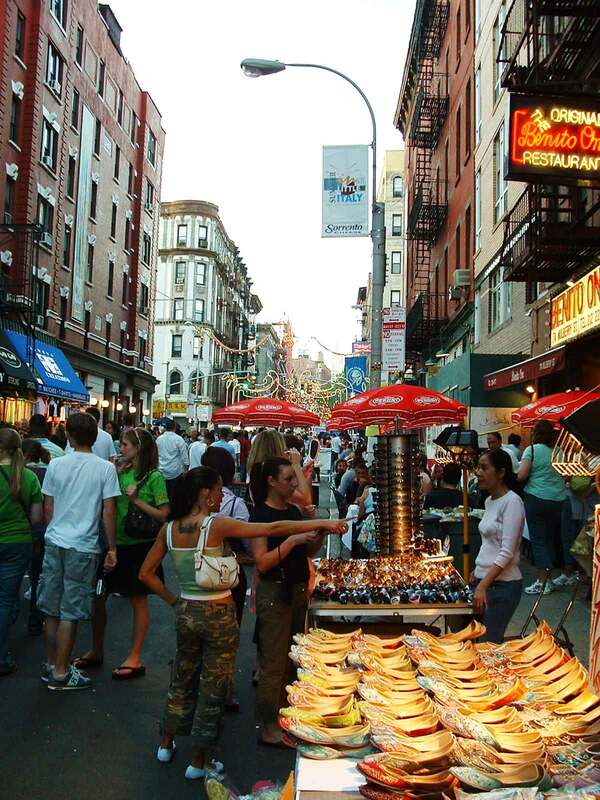 Once a big, thriving Italian neighbourhood, Little Italy has almost been swallowed up by Chinatown, but what still remains has a vibrant atmosphere. A brass band, sitting outside a restaurant, play cheerful tunes as we wander along a narrow, cobblestone street that’s densely packed with people and lined with Italian restaurants. If we hadn’t had such a big meal we might be able to appreciate more the smells of Italian cuisine and the sight of people eating enormous meals at the tables outside each restaurant. About a mile further on, the sky has deepened now to the purple shades of evening. We dawdle along, enjoying a soft breeze. By the time we’re heading north up Broadway back to our hotel, it’s late at night, but the streets are buzzing with people. The city is still zinging. Back in the hotel the show isn’t over. One final curtain call to come. We pull back the dark curtain on a side-window in our eleventh-floor bedroom and find a view dominated by the Empire State Building. It’s a couple of streets away but it looks near enough to reach out and touch. Fully illuminated in the blackness of night, it stands, tall and proud, in all its splendour. This provides a fitting end to the kind of day that blazes its way deep inside memory cells, never to be forgotten. This entry was posted in Uncategorized and tagged Battery, Chinatown, ferry, holiday, Manhattan, New York City, Statten Island by Jean Davison. Bookmark the permalink. Thanks, Ruth. I’m pleased you enjoyed it.